Derp Pikachu starts a staring contest with the enemy. The enemy starts to get sweaty, dehydrated, and instantly faints from the awkward staring contest. 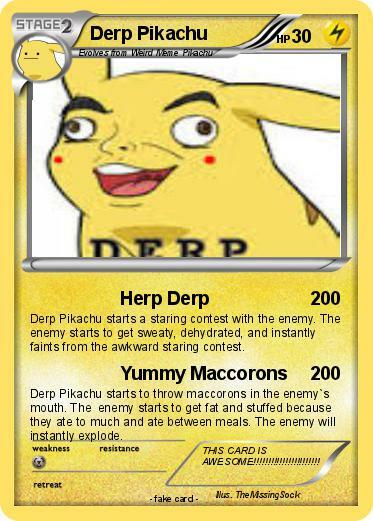 Derp Pikachu starts to throw maccorons in the enemy`s mouth. The enemy starts to get fat and stuffed because they ate to much and ate between meals. The enemy will instantly explode. Comments : THIS CARD IS AWESOME!!!!!!!!!!!!!!!!!!!!!! !